It seems that I am making headway on my New Year's resolution to quilt my own tops!! This excites me beyond belief!! Yesterday, I had my Stepping Stones quilt on the long arm. I adore this quilt. The pattern can be found here. 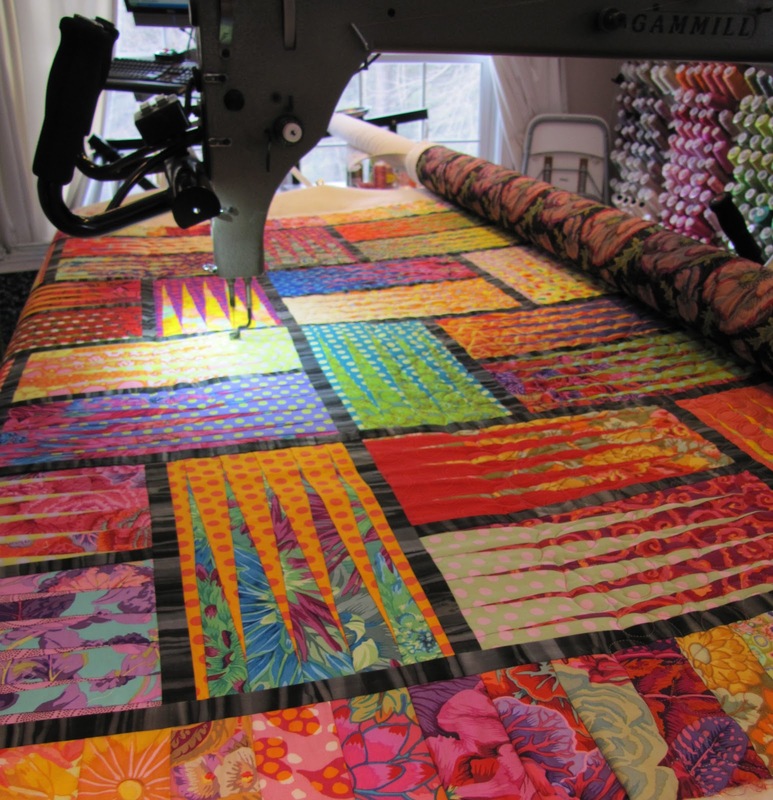 You must all know what it feels like to really adore a quilt that you have made, right? This is one of those quilts. I made it with all Kaffe Fassett fabrics from my shop. Half of the blocks are the prints, and the other half are spots and dots. Of course, I had to choose the brighter and bolder prints. No pastels here. Here is a close up of the quilting. I am doing an edge to edge pattern of feathers. Because there is so much going on with the prints here, I really just needed texture on this quilt. The thread that I am using is a Superior Lava thread. I love it because has a little sheen to it and really picks up all the colors in the fabrics. I think I will do the binding in the black batik that I used in the sashing. That will frame it up nicely. Stay tuned for more pics! I am teaching this class on Friday in my studio, so it is actually nice that it is now quilted. Click here to see my teaching schedule. Don't forget to enter my giveaway going on here.